The fight for the 12 Croatian seats in the European Parliament will be much more interesting than last year's. Then, Croatia was about to enter the EU on July 1st, and elected its first representatives in Strasbourg for a thin one year mandate. The debate focused on the cost of the elections for taxpayers, the opportunity to incorporate them in local elections, and on the prospective wages of EU deputies. Now, the upcoming May's elections are a top priority for both governing and opposition parties. Both governing Social Democrat Party (SDP) and main opposition party Croatian Democratic Union (HDZ) see the elections for the European Parliament not only as a way to assess the support of the electorate, but also as an opportunity, in case of victory, to improve their rating on the local political scene. One of the main changes introduced by the Lisbon Treaty is that, when the EU Member States nominate a candidate for the role of president of the European Commission, succeeding to José Manuel Barroso in autumn 2014, for the first time they will have to take into account the results of European elections. The new Parliament will then, quoting the words of the Treaty, "elect" the President of the Commission. This means that voters will have a say on who will take over at the helm of the EU executive. Currently in Parliament there are seven groups, ranging across the entire political spectrum and representing over 160 national parties. For the HDZ, a victory in the European elections could be a good opportunity to demand early parliamentary elections (ordinary ones will be only at the end of 2015). The victory of the SDP, on the other hand, would confirm a stable support of voters. The two parties have kept a nearly equal pace for months: according to the latest polls, the SDP is supported by 23.4 percent of the citizens, followed by the HDZ with 20.5 percent. Of the current 12 seats at the EP, five are occupied by the HDZ, five by the SDP, and the remaining two by the Croatian Labour Party and the Croatian Party of Law. Yet, last year, the HDZ list included also Ruža Tomašić, president of the Croatian Party of Law founded by Ante Starčević, with which the HDZ party had signed a coalition agreement. The HDZ party therefore regards itself as the winner of last year's European elections, having obtained one seat more than its opponents. Because of Tomašić, however, the HDZ received a sharp rebuke from the president of the European People's Party, Joseph Daul, who warned HDZ leader Tomislav Karamarko about the behaviour by Ruža Tomašić, deemed unacceptable. Not only did Tomašić strongly oppose Croatia's accession to the EU, but, after being elected in the HDZ list, she joined the group of conservatives and reformists instead of the European People's Party (which gathers the Christian Democrats and is supposed to include the HDZ). "I have nothing against Ms. Tomašić. I do not know her. I respect her stance. But she cannot be elected with the list of the European People's Party. You cannot be elected according to values that you do not defend. If you are a Euroskeptic, you have to be elected with the list of Euroskeptics. This is what I respect, this is democracy. You cannot be elected in accordance with European values and then move to the side of Euroskeptics. You just cannot", bluntly stated Joseph Daul in a recent interview with Zagreb newspaper Večernji list. Having a representative in the European Parliament has also become a matter of prestige for the smaller parties. 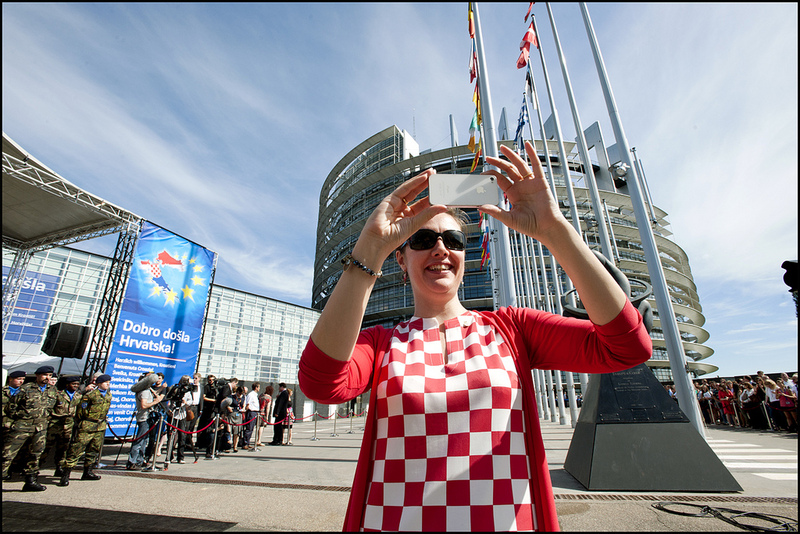 Last week, aware that they cannot get enough votes on their own to bring one of their representatives in the European Parliament, eight small right-wing Croatian political parties founded the Alliance for Croatia. There would be nothing strange in all this, except that the Alliance is led by the HDSSB party of Branimir Glavaš, who is serving an 8-year sentence for war crimes in Mostar, Bosnia and Herzegovina. Glavaš had escaped from Croatia before the court delivered its judgement in Zagreb, and was hiding in BiH, but later a BiH court upheld the Croatian ruling. But Glavaš continues to lead the party from behind bars, and his HDSSB counts seven deputies in the Croatian Parliament. Even if this is not stated publicly, the HDSSB wants to take advantage of the Alliance it created to acquire greater political power (the other parties do not have deputies in the Croatian Parliament) and place its own candidate at the top of the coalition list. Altogether, these parties obtained nine percent of the votes at last year's European elections – a result which, if repeated in coalition, would enable them to place a deputy in Strasbourg. Therefore Croatia, the youngest member of the EU, may end up with a European deputy from the party founded and led by a person who is serving a sentence for war crimes. In this case, nothing would prevent the HDSSB deputy from showing up in Strasbourg (during parliamentary sessions) and Brussels (during the sessions of parliamentary committees) with the pin reading "Hero, not criminal" that is usually worn by all seven HDSSB MPs in the Croatian Parliament – as a way to let the public know they consider Glavaš a hero and not a criminal. Although three months separate us from the elections for the European Parliament, the campaign – though officially yet to start – is already very interesting. Meanwhile, citizens impoverished by the long economic crisis, which does not seem to end, look at this race for a seat in Strasbourg through the lens of MEPs' salaries, salaries they can only dream of.